During the 1920s, race cars built by the Sunbeam Motor Car Company in Wolverhampton, England captured the World Land Speed Record (LSR) five times. 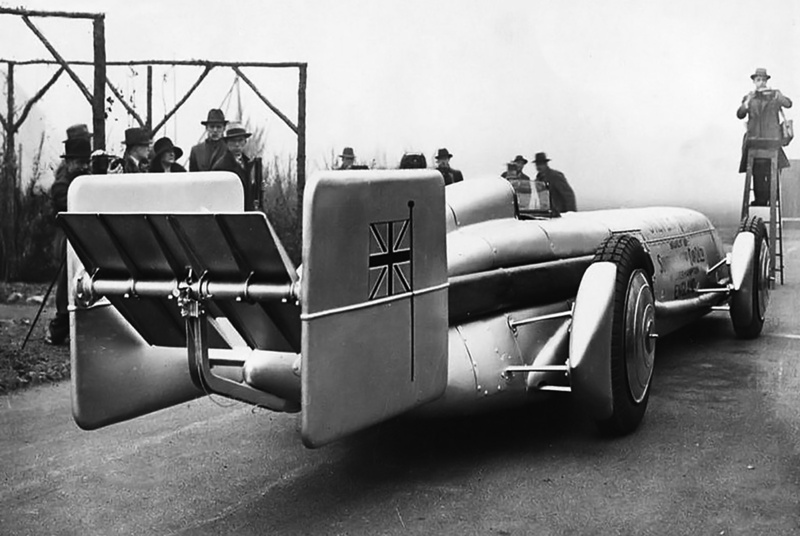 The last record for the company was set by the Sunbeam 1,000 hp Mystery Slug, a specially-built LSR car designed by John Irving that Henry Segrave used to achieve 203.793 mph (327.973 km/h) on 29 March 1927. Segrave and Irving then parted ways with Sunbeam, and the record held by Sunbeam was broken in 1928. Segrave recovered the record on 11 March 1929, hitting 231.362 mph (372.341 km/h) in the Irving-Napier Golden Arrow. Wanting to recapture the record, Sunbeam went to work on a new LSR car to push the record up to 250 mph (402 km/h). The Sunbeam Silver Bullet with Kaye Don in the cockpit during the car’s public debut in February 1930. Exhaust from the engines was collected in the long black manifold that ran along the side of the cockpit. The bulge along the lower side of the body covered the steering drag link. 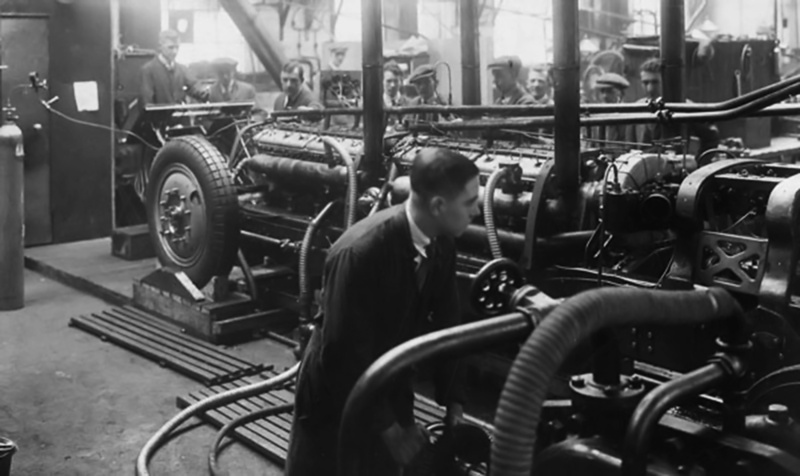 Designed by Sunbeam’s chief engineer Louis Coatalen and chief designer Hugh Rose, the new Sunbeam LSR car was specially-built and powered by two engines. 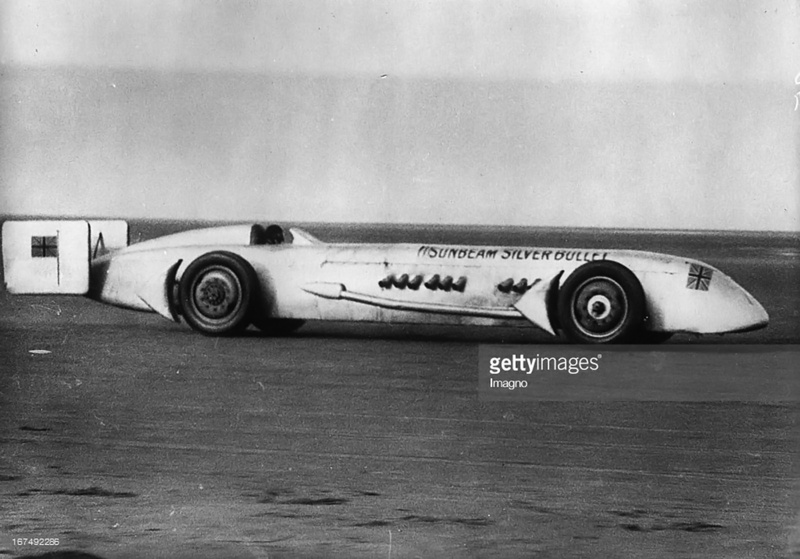 The car was named Silver Bullet, most likely a retort to Segrave and Irving’s Golden Arrow. Unlike the 1,000 hp Mystery Slug that was built using what was available at the Sunbeam factory, construction of the Silver Bullet was an entirely scratch-built affair. The car’s design was refined by model testing in the Vickers Aviation Department’s wind tunnel. The Sunbeam Silver Bullet was composed of very stout steel frame rails that were 13.5 in (343 mm) in height at their tallest point. The frame rails were joined by various crossmembers and supports that arched from rail to rail. The body of the LSR car was made up of streamlined aluminum panels, and an underbody enclosed the bottom of the chassis. The wheels sat outside of the Silver Bullet’s body and were trailed by aerodynamic fairings. The Dunlap tires were 37 in (940 mm) tall and 6 in (152 mm) wide. Steering was achieved by separate drag links that extended from the cockpit at the rear of the car to the front wheels. A long bulge on each side of the body covered the drag link. Twin fins at the rear of the car helped stabilize the racer at high speeds. A horizontal member between the fins rotated down to act as an air brake. The car used water-cooled hydraulic brakes at all four wheels. The incomplete Silver Bullet with engines installed. Note the routing of the induction pipe from the supercharger and around the rear (left) engine. The empty space in front of the forward (right) engine was for the ice tank. The steering drag link for the right wheel can be seen on the outside of the right frame rail. 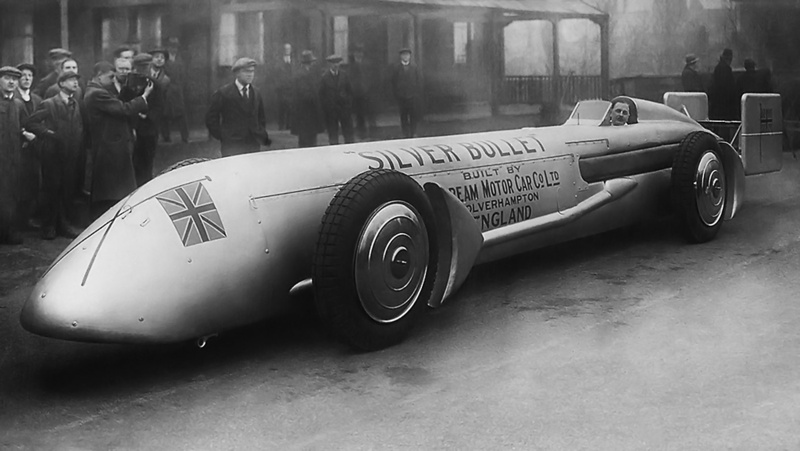 The Silver Bullet was powered by two water-cooled V-12 engines built especially for the racer. To keep the engine and the car as narrow as possible, the engine’s bank angle was set at 50-degrees. The engine was made of aluminum and had four valves per cylinder. Two overhead camshafts actuated the valves for each cylinder bank. Each cylinder bank was composed of two three-cylinder blocks. The single spark plug per cylinder was positioned between the valves in the top of the combustion chamber. The two engines in the Silver Bullet were installed in tandem, with the front of both engines toward the rear of the racer. A secondary shaft integral with the crankcase and positioned under the crankshaft of each engine coupled the engines together and transferred their combined power to the transmission. Engine exhaust for each cylinder bank was collected in separate manifolds that extended back along both sides of the Silver Bullet and under the engine cowling. Just behind the rear engine, the exhaust manifolds on each side of the car joined into a single manifold and emerged from under the cowling. These large exhaust manifolds ran alongside the cockpit and extended back to just before the Silver Bullet’s tail. Detail view of the Silver Bullet’s single supercharger. The two carburetors are on the left, with the steering box just below. Note the relatively sharp bends of the induction pipe. The engine had a 5.51 in (140 mm) bore and a 5.12 in (130 mm) stroke. It displaced 1,465 cu in (24.01 L) and produced 490 hp at 2,400 rpm normally-aspirated, but a supercharger was incorporated into the Silver Bullet’s design. 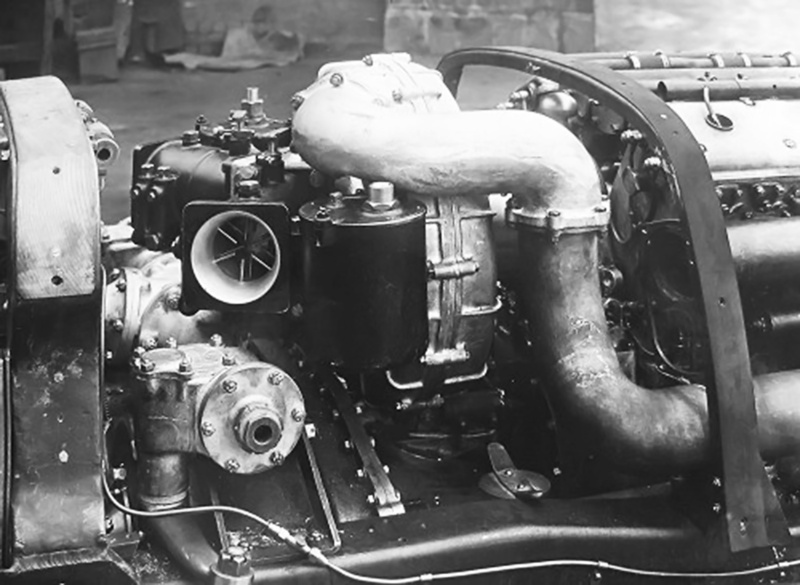 Initially, four Roots-type superchargers were to provide each engine with induction air, and this configuration was tested on one engine in November 1929. However, the final supercharging system was a single unit of the centrifugal type providing air to both engines. The supercharger was driven at up to 17,000 rpm by the rear engine and provided around 7 psi of boost. Separate induction pipes extended from the supercharger along both sides of the rear engine. The pipes connected to an induction manifold positioned in the Vee of the front and rear engines. Exactly how much power the engines produced with supercharging is not known. It is entirely possible that a true power test was never undertaken. Regardless, Coatalen had no problem claiming the engines would produce 2,000 hp (1,491 kW) each at 3,000 rpm, making the Silver Bullet a “4,000 hp car.” Both the peak engine output and rpm seem to be rather optimistic figures. Two carburetors fed fuel into the air as it was drawn into the supercharger. The secondary shaft from the engines to the transmission spun at over twice engine rpm. The higher speed decreased torque and allowed the use of a smaller diameter shaft. At 2,600 rpm engine speed, the three-speed transmission had theoretical top speeds of 135 mph (217 km/h) in first gear, 180 mph (290 km/h) in second gear, and 266 mph (428 km/h) in third gear. While Sunbeam wanted to break the record of 231 mph (372 km/h) and planned to reach 250 mph (402 km/h), it was hoped that the car would ultimately hit 265 mph (426 km/h). The output of the transmission was in the form of two drive shafts that extended back on either side of the cockpit to the rear axle. The two-drive-shaft arrangement lowered the driver’s seat and the overall height of the Silver Bullet. The Silver Bullet chassis with both engines installed undergoing a test run. By all accounts, there was no time for any serious testing of the engines or the car before it was shipped to the United States. The reinforced structure on the right sits just before the cockpit. An 11.5 cu ft (.33 m3) ice tank that held 616 lb (279 kg) of ice was installed in the nose of the Silver Bullet. Water from the engines was cooled by the ice and then returned to the engines. The 30-gallon (25-imp gal / 114 L) fuel tank was positioned in the streamlined fairing behind the cockpit. The cockpit was sized specifically for Kaye Don (Kaye Ernest Donsky), who raced for Sunbeam and had shown exceptional talent on the Brooklands race track, setting numerous records. The steering wheel was detachable for cockpit entry and exit. A fireproof bulkhead was positioned between the engines and the cockpit. The Silver Bullet was 31 ft 1 in (9.47 m) long and 6 ft (1.83 m) across at its widest point. However, the body was under 3 ft (.91 m) wide. The car had a 4 ft 11 in (1.50 m) track, a 15 ft 5 in (4.70 m) wheel base, and 7.75 in (197 mm) of ground clearance. The top of the cowling over the engines was 44 in (1.12 m) tall, and the highest point of the car, just behind the cockpit, was around 53 in (1.35 m) above the ground. The Silver Bullet weighed around 6,000 lb (2,722 kg) dry and around 7,500 lb (3,402 kg) record-ready. Rear view of the Silver Bullet illustrates the air brake in the deployed position. It is interesting to consider how much drag the horizontal member created when it was in its normal position. The engines were installed by 1 February 1930, and the Silver Bullet made its public debut on 21 February. Very little testing was done before the car left for Daytona Beach, Florida on 26 February. The Silver Bullet and crew arrived in Daytona on 8 March and immediately began work on the car. The Silver Bullet was started on 13 March and was ready for a run the next day. However, the timing equipment was not ready, and no run was made. The first test run was made on 15 March, and the Silver Bullet recorded an unofficial speed of around 150 mph (240 km/h). An attempt was made on 17 March, but serious trouble was encountered when the air/fuel mixture self-ignited due to excessive heat in the long induction manifolds. This phenomenon created a backfire that routinely damaged the supercharger housing and its impeller. Part of the issue was that the induction pipes from the supercharger ran in close proximity to the exhaust manifolds, including a point where the intake crossed under the exhaust from the front engine. This created a localized area of high temperature in the induction system. On first glance, the Silver Bullet gives the impression of a sleek and powerful vehicle that is ready to set speed records. On closer inspection, one begins to wonder just how much drag was created by the complex drag link covers, elaborate exhaust ducting, irregular body panels, and exposed fasteners. At the time, the science of aerodynamics was in its infancy. The single supercharger arrangement and its complex piping left no way to cure the issue without significant modifications. Regardless, the Silver Bullet team tried to fix what they could and strove for a decent run up and down the beach. Modifications were made to vent exhaust from the front engine out the cowling rather than collecting it in the manifolds, but induction issues persisted. To make matters worse, the course was rough, and Don had to fight the car the whole way. Don tried again on 18 March, recording an official and disappointing two-way average speed of 171.019 mph (275.229 km/h). However, the Silver Bullet did manage to set a new American record for the flying 5 miles (8 km), averaging 151.623 mph (244.014 km/h). Bad weather, poor course conditions, underperforming engines, and other teething issues on the untested LSR car all combined to delay further record attempts. During this time, various modifications were applied to the Silver Bullet. Another attempt was finally made on 31 March. The speed recorded for one direction was 186.046 mph (299.412 km/h), but issues caused further runs to be aborted. More delays were encountered and modifications undertaken. The next significant run occurred on 10 April, with 175.72 mph (282.79 km/h) speed in one direction being recorded. Don sits in the Silver Bullet on Daytona Beach. The image was taken on 14 March 1930, before any real issues with the car had been encountered. Note the slight exhaust staining just before the tail fin. It is doubtful that the wheel fairings improved aerodynamics much, given their distance from the tires. After over 18 record attempts, the Silver Bullet’s issues proved to be too much to overcome, and the timing crews could not stay on the beach indefinitely. Coatalen ordered a return to England on 13 April. Sunbeam was struggling financially, and little further effort or expense was expended on the Silver Bullet. The Silver Bullet was sold to Jack Field, a hotel and garage owner and gentleman racer. Field modified the car to resolve its issues and improve its reliability. All of the modifications are not known, but the exhaust manifolds running along the car’s sides were completely discarded in favor of 12 individual exhaust stacks that protruded from the cowling. Incidentally, the eight Roots-type superchargers originally planned for the car were included with the spare parts sold to Field. On 21 March 1934, Field made an attempt to capture the British absolute speed record (top speed achieved on British Empire soil), which then stood at 218.54 mph / 351.71 km/h (set by Malcolm Campbell at Verneuk Pan, South Africa on 21 April 1929). Field averaged 174.09 mph (280.17 km/h) in one direction on Southport beach, but the Silver Bullet caught fire, and further attempts were abandoned. Field sold the damaged car to famed motorcycle racer Freddie Dixon. Reportedly, the sale price was only £10, and adult beverages were involved. Dixon later determined that the car possessed little that he could use, and the Silver Bullet was scrapped. This entry was posted in Automotive and tagged Land Speed Record on 5 June 2018 by William Pearce. Thank you for the very nice exiting sad ending story. Was this the first LSR car to feature a movable air brake? Hello Graham, I believe it was.